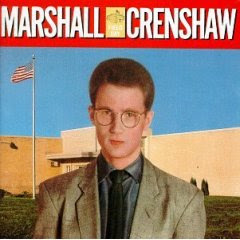 Marshall Crenshaw, a certified member of a dying breed, the rock and roll singer/songwriter. Not rock. Rock and roll. Here is a proven commodity: Detroit native Crenshaw cuts an amazing debut album in 1982 for Warner Brothers, full of All-American Strat-driven early 60's rock hooks and riffs, light enough to verge on pop, hard enough to get away with being called "rock and roll." Twelve songs that just won't quit. The critics fall over themselves calling it a masterpiece, and damn, they're right this time. So now it's time to follow it up, and Crenshaw makes a bit of a left turn. Instead of retaining the services of the first album's producer, 60's rock producer Richard Gottherer, he taps hot upcoming English producer Steve Lillywhite, who has had a hand in U2, Peter Gabriel, Simple Minds, and many other English new wave bands. The result, Field Day, catches everybody by surprise -- while the songs are still top notch, the album sounds like it was recorded on inexpensive analog equipment. The drums clatter, the echo feels like slapback delay, the guitars sound big but saturated. Clearly their plan was to make a real retro sounding American rock record, turning back the hands of time 20 years when it was all recorded on four- and eight-track tape. The critics and the public didn't know what to do, simply because it didn't sound like the first. Warner Brothers gave me this record and I had the same reaction: I put it away after a jump-the-gun judgment call. However, Crenshaw pulled out one of his rare hit singles from it, and it remains one of my very favorite Crenshaw songs, which is pretty hard to do considering his quality output. "Whenever You're On My Mind" had all the hallmarks of songs I love: unusual chord changes that sound perfectly natural, strong melody, a solo that echoes that melody, a bridge that works, all wound up in three minutes. Frankly, you can describe many of Crenshaw's songs this way, but I can't help pulling this one slightly above the others. The video for "Whenever You're On My Mind" is typical 80's goof, and I'm surprised Crenshaw indulged, but that's probably what Warner Brothers was paying for. This was one tough video to find, so enjoy it (and pardon the commercial before it). I love what the drums do right at the lead into each verse--it slips effortlessly over to the driving backbeat. Is there a name for that?